This Flinders Ranges photos page takes you on a journey through an ancient and fascinating mountain range in the South Australian Outback. 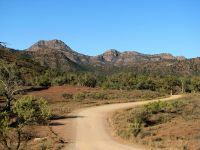 Touring the Flinders Ranges, you can have two worlds - a smooth ride on a perfect road, accommodation in a luxury resort like Wilpena or Rawnsley Park's eco villas. 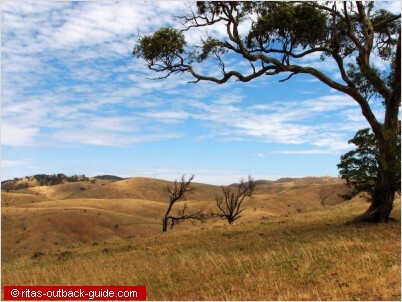 Or, you pack your 4WD and explore the ranges on side tracks, camp by a creek bed, and seek an adventure on the numerous four-wheel-drive routes available throughout the Flinders. It is your choice. Whichever way you explore this stunning area, you'll see amazing scenery. Don't forget your camera! Okay, let's begin in the southern Flinders. You'll notice the further north we come, the harsher the scenery gets. Ruins of homesteads tell the stories of those people who tried to turn the area into an agricultural district, growing wheat and breeding sheep. They started in years with good rainfalls but years of drought forced them to abandon their homes. 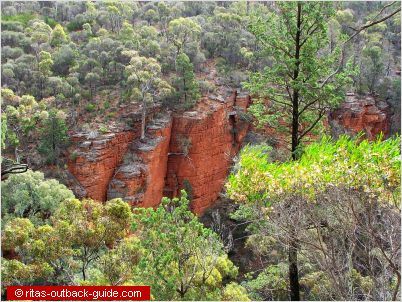 Alligator Gorge near Wilmington is the highlight of Mount Remarkable National Park in the southern Flinders Ranges. Car access to the gorge is from Wilmington, a short walk leads visitors to a fantastic lookout point. You can climb down to the bottom of the gorge, or walk around the rim of Alligator Gorge. A walking trail from Melrose leads to the gorge as well. 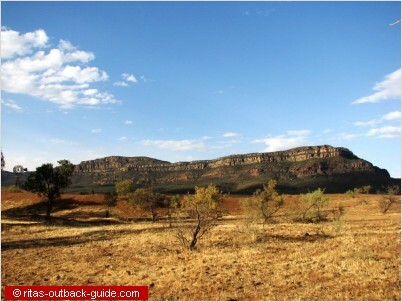 Kanyaka Historic site is by far the largest site of ruins in the Flinders Ranges. Kanyaka is legacy of the pastoral sheep runs that marked the early settlement of the Flinders Ranges and South Australia. After the devastating drought from 1864 - 1867, 20,000 sheep were lost. The run was divided into smaller holdings, and finally, the homestead was abandoned in 1888. 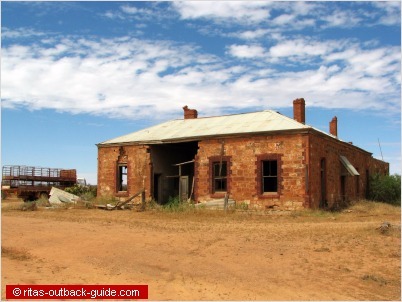 Rawnsley Park Station is a sheep station on the southern edge of Wilpena Pound. It is a wonderful place to stay for a couple of days and explore the Flinders Ranges National Park. Gum trees, like his majestic river red gum, inspired Australian photographer Harold Cazneaux (1878-1953). He took a photo of the tree in 1937, which became one of his most famous. He called it "The Spirit of Endurance". Today the tree is widely known as the "Cazneaux Tree". 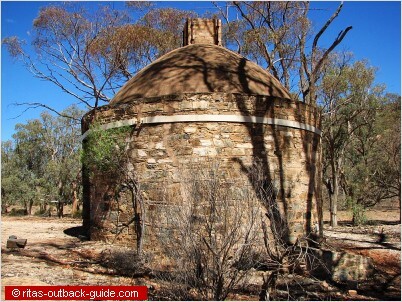 The Bolla Bollana copper smelter was established 1870 in the northern Flinders Ranges. There are a few ruins and this well-preserved kiln on the site. 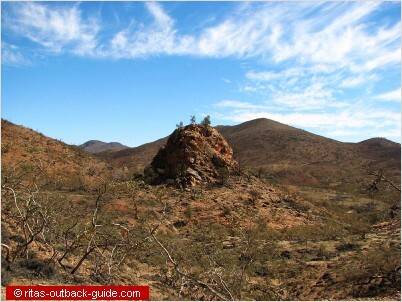 Bolla Bollana is just 7 km north-west from Arkaroola village along the track to the Yudnamutana mines. 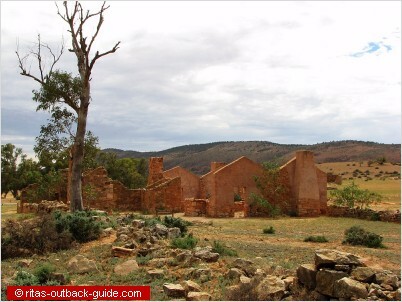 One of the many ruins and ghost towns in the central Flinders Ranges. Johnburgh is located just 30 km north of Ororroo. Bird life was plentiful during our stay at Rawnsley Park Station. 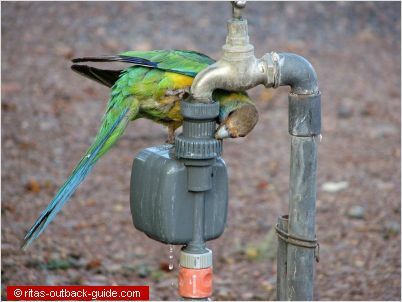 It was fun to watch this clever bird trying to get a drink. 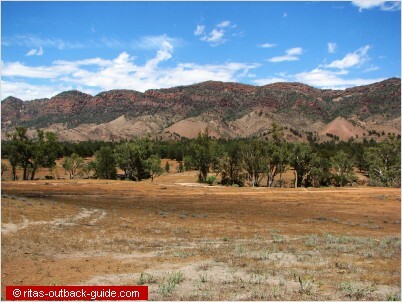 This lovely valley is on the northern boundary of Flinders Ranges National Park. Sir Hans Heysen (1877-1968) was another artist who became influenced and inspired by the natural beauty of the Flinders Ranges. He first visited the Flinders in 1926. One year later, he returned and stayed at Aroona to begin one of many paintings and sketches of the Flinders Ranges. He was fascinated with the arid landscape. Can you blame him? This beautiful spot can be found on the way from Arkaroola village to the Paralana hot springs. 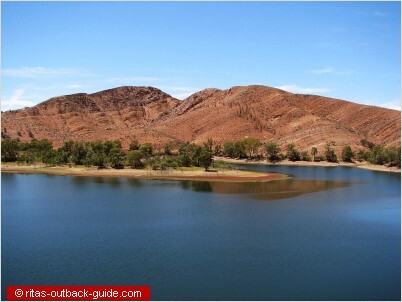 Aroona Dam is a beautiful spot for a picnic a few km outside Leigh Creek. The dam was built 1955 to supply Leigh creek and the coalfields with water. 1995 the Government declared the area around the dam as a flora and fauna sanctuary to rehabilitate the badly degraded area. 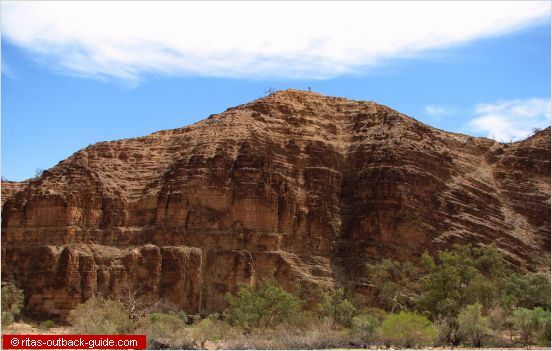 If you don't want to do the planning for a journey to the Flinders Ranges yourself, you can also join a guided tour from Adelaide. Viator is an international online booking company, they work with reliable local tour operators to offer the best tours. 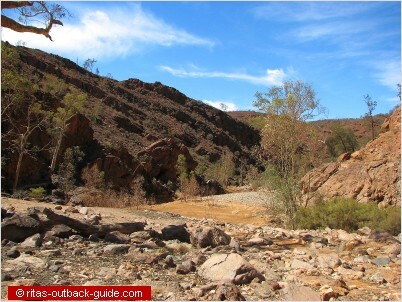 decide for this extended 5 days tour that takes even further north to Arkaroola. 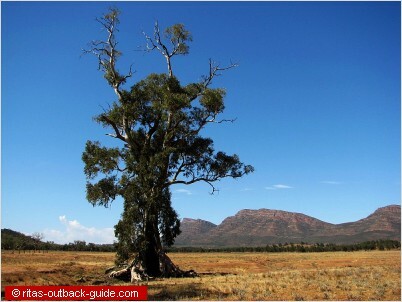 Disclosure: ritas-outback-guide.com is not a tour operator. I do research to find tours with great reviews and recommend my favourites. Tour links on this page are affiliate links. This means when you book a tour I earn a small commission (there is no extra cost for you) that helps to maintain the website. If you are interested in a tour, you may make the booking on the provider's website. Be sure to read all details before you book. Thank you for supporting this website.